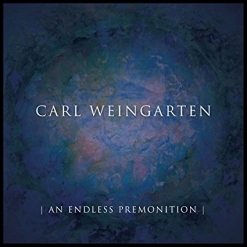 An Endless Premonition a suite of five extended pieces of what SF Bay Area composer/guitarist/producer Carl Weingarten refers to as “symphonic space guitar.” Grammy-winning bassist Michael Manring is featured on two of the tracks, but all of the other instrumentation and sound effects are created on electric slide guitar with looping and atomic delays. This really surprised me, as I assumed that many of the sounds were generated with synths and electronic keyboards. It is interesting to note that Weingarten started exploring long-form atmospheric sounds as far back as 1979 and on his early recordings such as Submergings (1981). Of course, the tools and toys have changed dramatically over the last 35 years, and Weingarten didn’t want his new album to sound like the many other artists in the field who use looping techniques, so after experimenting for awhile, he started using the guitar as a “trigger” to produce sounds that are in constant change whether or not he is actively playing. As a result, the effects are usually in the foreground rather than the usual more melodic sounds of the guitar. The tracks were all recorded live in the studio and are first-takes with no overdubs. It is also very interesting to learn that Weingarten’s college degree is in film-making, not music, and that before he started playing the guitar as a teenager, his focus was in the visual arts. An avid photographer as well as a musician, Weingarten’s music has many of the characteristics of a film soundtrack that evokes vibrant, colorful images in the mind. The five tracks range in duration from about 6 1/2 minutes to almost 15 1/2, with three tracks well over ten minutes each. So, writing a brief summary of each is difficult at best - especially when the music is so ambient and ethereal. The overall effect of the album is one of slowly and peacefully floating through deep space, unthreatened and unencumbered by any earthly ties. I find it extremely relaxing. An Endless Premonition is a masterful creation that sounds effortless. 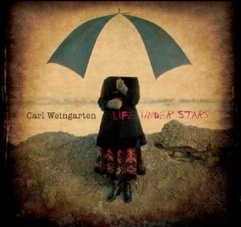 It is available from Amazon and CD Baby as well as www.CarlWeingarten.com. If you like ambient and/or space music, this is a must!